ABL-SF is committed to providing quality programs that will prepare Asian Pacific Americans to overcome the challenges in today’s fast-changing business environment. From the Youth Program targetted at high school students to Executive Leadership programs, ABL-SF is dedicated to leadership development. ABL-SF is reaching out to future business leaders at the secondary school stage of their education by stimulating their career aspirations. Our aim is to bring speakers from varying professional backgrounds to students to provide them with opportunities to see and hear many facets of career tracks that are possible and show them how to get there. ABL-SF engages individuals ready for the next stage in their careers and who seek to continue working on their managerial/leadership skills through seminars to workshops. These seminars and workshops also allow for open discussion in which to gleam information from fellow colleagues who have faced similar issues. 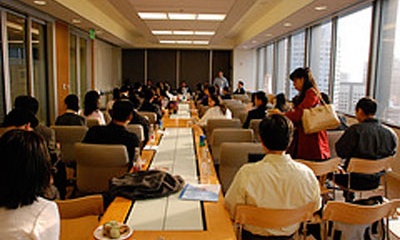 ABL-SF strives to promote meaningful connections between corporate professionals and entrepreneurs in the Asian business community. Towards that goal, we have hosted networking events, social events, and educational seminars on various aspects of business development.